It took me a great deal of time and thought before I was satisfied with the set up of the Amelorica World. Below I’ve explained more about the world in greater detail and at the very bottom is a map with various descriptions. Scavengers seem animalistic, frothing beasts, however they aren’t. In Birch’s Faith they are mentioned, but never revealed as I wanted to be able to explore them in depth. Therefore, they are introduced as a teaser in Birch so you can see the dangers these villagers face on a daily basis. In D’Reaper’s Destiny, Vyolet’s Stryfe and several other books within the series I explore each class within the Installation and the Installations themselves. Scavenger Installations began as places where the government hid the scientists experimenting during The Dying. When nothing worked and the world fell into The Chaos the scientists and their experiments remained here for protection. Through the years it slowly evolved into what you see today with different classes within the facilities. Each class has a tattoo marking them if they have passed certain tests. The tattoo scrolls around the base of their neck with a letter below the pulse point on their chest, there are tattoos on each wrist as well. The Abiras are the individuals who now conduct the experiments. Gene mutation and DNA manipulation to name a few. I chose this name as Abira in Hebrew means strong and though they seem weak compared to all the other classes, they are the strongest as they are the creators. An Abira has an ‘A’ tattooed amidst the scroll work. The Death Shepherds are the third tier within the Installation. They are bred to protect the Abiras and Leaders. Their abilities vary from walking within shadows to astral projection assassination. This group leads the tests for the facilities as well as the torture. They are the Installations’ boogeymen. Though they do many things with their energy they are also warriors as again they are the second in command below the Leaders. The Death Shepherd has a ‘D’ tattooed amidst scroll work. The Jingoists are the most common within the Installation. They are bred to control the Broken, the Warriors and other Scavengers that Leaders use in the field. More volatile and animalistic these individuals are extremely aggressive. Most can be identified by not only their tattoos, but also by their hair changing from it’s natural color to blood red and the whites of their eyes becoming red as well. They have a ‘J’ within the scroll work. The Broken are individuals that have been tortured so much they are literally broken. These are not rare within the facilities. These are the animals and raving beasts seen by humans outside the installation. They are the epitome of insanity and have no markings. The Warriors/Soldiers are also used for raids and guarding the facility, however their use is different than the Broken in that they are more strategic. This is the army. They are bred with strength and agility. The Truthsayers are used in special circumstances. They are extremely rare. They are not bred nor made. They are individuals who were bred to be Abiras or Death Shepherds who have had their mind ravaged so badly they are no more. It is a rare occurrence for Truthsayers to leave their installation and are primarily kept as pets. This special rank has a ‘T’ tattooed within the scroll work, however they also have red ‘X’s on the corner of their left eye stating how many Betrayers the thing has found within the Installation. The Drudges are the last class within the Installation and are aptly named. These individuals have no markings, they are the lowest of the low. They are unremarkable in every way from their appearance to having no energy, no strength and no agility to assist the soldiers. This class is at their base forms maids and butlers within the Installation. They clean up the pits after the carnage, the blood after the torture and whatever else they are commanded. After The Chaos had passed and the Warlords subdued, the remaining individuals that had formed the armed forces turned to the east. Their goal was to stop the Mutants from spreading across the whole continent and contaminating the human race. With this in mind they reinforced natural barriers, blew up all the bridges and created a massive chasm to the east to pen the mutants in. This area became known as the Mutant Free Zone, or the MFZ and their residents referred to as Z’ers and their military became the Frontliners, or Liners. When things became more stable they began the process of forming the Council for the Protection of Humanity and their headquarters became Chios. The protection offered in this zone drew people in and made the MFZ the most populated region. To the West were villagers who preferred a simpler life. However, they faced different adversaries than the Mutants to the east. Instead, they faced Scavengers and Bandits. Both dangerous in their own ways. The Council in an effort to reduce violence forbid firearms for any but serving military and special military contingents. An effort made easier since ammunition was scarce and the MFZ controlled the only production facilities. This left the villagers all but defenseless, since Bandits still had guns and ammo and Scavengers were genetically enhanced However, many survivors quickly adapted and began using bows, staves, improvised explosive compounds and shockguns. Many people that had fled the old cities made their own villages, clans and communities and spread through the empty wastelands to the North and West. The areas nearer the MFZ are safer, while further away there is the safety of isolation. And though the individuals choose to flee from the oppression of Frontliners, they are also at a higher risk of being attack. Since The Dying Time has made a lasting impact many people still prefer isolation or a wandering existence, always on the move. I based the MFZ (Mutant Free Zone) City names on the names of various Demilitarized Zones around the world. It was a twist in that the military resided within these cities. I liked it in that it gave a nod at the past while setting these cities up. In the current Demilitarized Zones no military is allowed to occupy the space. However, I felt in my stories it was more about protection and buffering the remaining pieces of civilization from the mutants to the east. Mytilene was the last city to form within the MFZ and it is the smallest. Located in the corner where old Kentucky, Ohio and West Viriginia meet, this city is best known for its knowledge. Individuals go here for in-depth learning such as doctors, inventors, navigators, builders, etc. This city also houses the largest grid library. Chios is the largest of the cities. It is also the seat of the military and MFZ council as well as Chios Central Intelligence. This was one of the first cities to be inhabited and cleaned up. It is situated north of where West Virginia once was. Samos is a sprawling city taking up much of what used to be Ohio and is known for its varied agricultural farms. Mostly known for its alcoholic beverages. Icaria is a trade city closest to the ocean in the southeast and visitors flock to see some of the old world wonders as they still have the magnetic highways and a few Zynethic walls that mold on various commands. Located near Norfolk, Virginia many cultures and languages can be found here, since it was the primary sea route between the various continents over seas and the MFZ. It also is the most well known cultural center of the world. Two of the Villages to the West that are mentioned the most of my books are Kliendorf and Ketewah. There are more, however these are the two primary hubs as they are near the MFZ as well as central to most other villages. And The Meadow serves as a drop off and pickup point for flyers. And as I roll out more of my series I’ll fill in the maps and information. 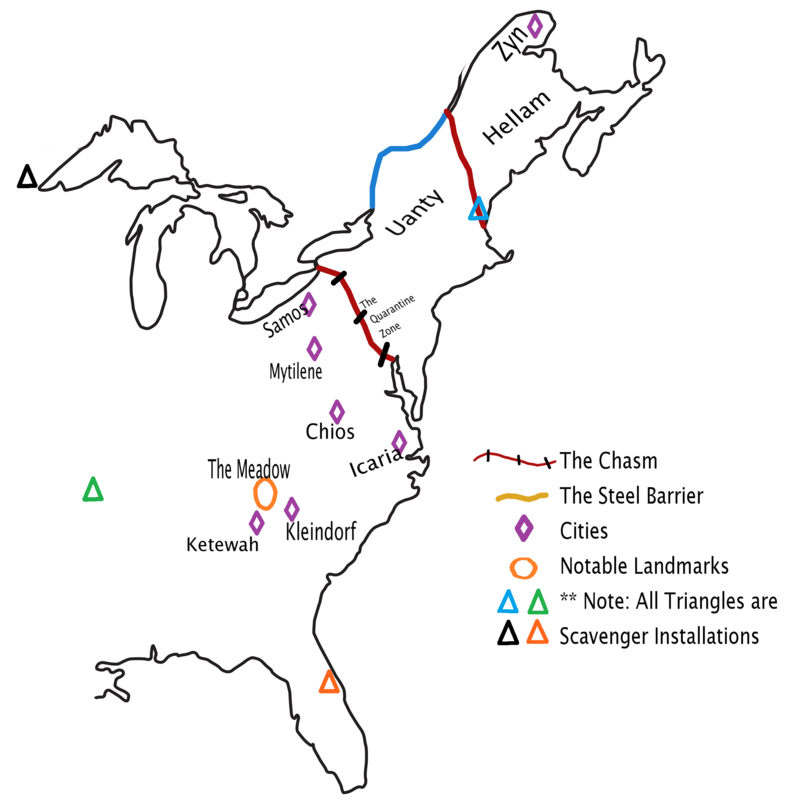 This section tells about the Scavenger regions of Woven Destinies. 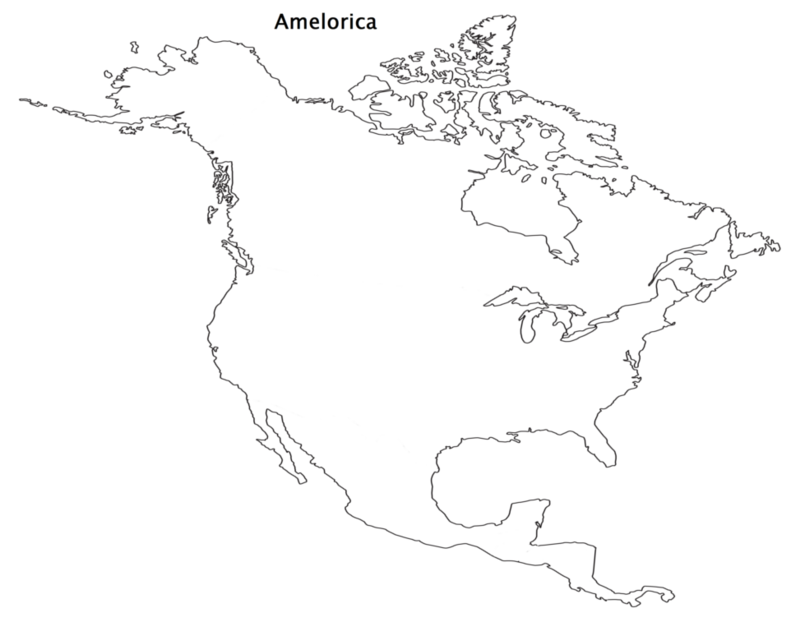 The largest map encompasses North America. I broke this down to make it easier to see each point. Each Scavenger Installation is based on a color and below I explain what the color is and the facility’s specialty. There are four primary installations with offshoots when the installation becomes too full. The Northern Installation is known for its starkness. It is the most brutal facility with no comforts. Their main focus is training Leaders, Warriors and Jingoists for the coming war. This is the Installation Reaper, Kaos and Naktmerié escaped from. It is almost always covered in snow. The color for the Northern Installation is White. However, because the map’s background is white I placed the triangle in black. The Southern Installation is known for its knowledge in energy. It produces more Truthsayers than the other facilities as it trains more Abiras and Death Shepherds. There are at least two of these Installations. The primary facility where Stryfe, Tyr and Íana are from and the secondary facility where Zroya was born. There is only one listed to the south as no one knows the location of the other…yet. The color for the Southern Installation is an Orange-red like flames. The Eastern Installation is known for its strategy. However, this installation has not been heard from since the Scavenger Wars. The color for the Eastern Installation is Blue. The Western Installation is known for their experiments, which pushes the boundaries beyond every other facility. It is a warren of caves to the west. Their primary focus is opening up unusual DNA patterns. These Scavengers have animalistic characteristics both inside and out for the world to see. We see portions of these Scavengers in D’Reaper’s Destiny as it’s the Installation Zroya is being traded to. This Installation is explored more during the book Sara’s Kaos when the facility imprisons Sara. The color for the Western Installation is Green.